Any business firm which is owned and run by an individual is called a proprietorship firm. On the other hand, a proprietorship is a company which is not registered with the state as a limited liability company or corporation. The owner does not pay income tax separately for the company, but he/she reports business incomes or losses on his/her individual income tax return. The owner is inseparable from the proprietorship, so he/she is liable for any business debts. Filling the prescribed Account opening Form showing his representative character as proprietor along with specimen signature card, KYC and profile form. Attested copy of Valid Trade License issued by competent authority. Membership certificate from local business association/Chamber of Commerce etc. National Identify Card/ Any valid photo ID/Citizenship Certificate. As per partnership Act, 1932 “PARTNERSH1P’’ is the relation between persons who have agreed to share the profits of a business carried on by all or any of them acting for all. Persons who have entered into the partnership with one another are called individually “PARTNER’’ and co1lectvely “A FIRM” and the name under which their business is carried on is called the “FIRM NAME”. There must be a contract/agreement between the persons who are associated with the business. The object of the business must be the earning of profit. 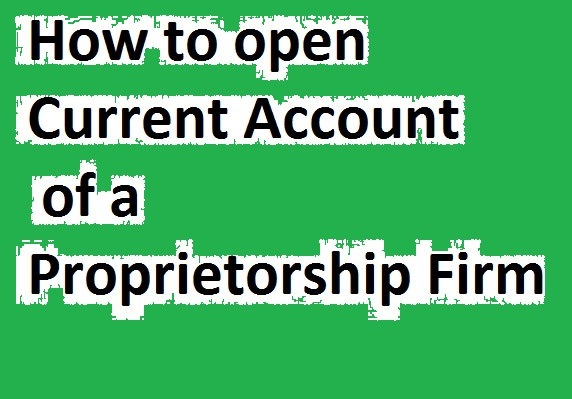 How to open Current Account of a Proprietorship Firm? Note: Opening of Partnership Accounts- A Banker should not open an account in the name of a partnership unless one or more of the partners apply to him to do so. Except where the partner, making an application for the opening of an account in the firm’s name, is deprived of the power, which fact is known to the banker, there can be no legal objection to a banker opening an account in the name of the firm at the request of any one or more its partners. Failure, however, to make proper enquiries by referring to the partnership agreement or any other record in writing which may be available before opening an account on behalf of the firm in a partner’s name may lead a banker in trouble. Filling the prescribed Account opening form along with specimen signature card, KYC and Profile Form. Attested copy of valid Trade License Registered partnership Deed etc. Clear Resolution for opening & operating the account borrowing power authority to give security, or to sell the property owned by the firm signed by all the partners. In case of death, of any partner, if the a/c is operated on by other partners as well, the surviving partners shall be advised to close them and open a new A/c fresh mandate. Photographs of the Account holder(s).